In my last position, I had to order food for meetings every once in a while. Okay, one might think, not a big deal just look at the catering menus, pick out a few different types of sandwiches and carry on with your day. Well, that was not the case for me. Instead, I would do as I was asked but then I would actually go home and try to replicate the menus that I had been dreaming of ever since placing that order at 10 AM. The life of a “forever hungry” person is not always easy 🙂 Pictured above are mini sandwiches I made for an Ugly Sweater Holiday Party we had at our house in December. It is a smoked turkey sandwich with cheddar cheese, spinach and cranberry mayonnaise on an onion roll. I added the onion roll because the flavors of onion and cranberry just mesh so well. Now I am not going to pretend like these were the best things I have ever made. Remember, I am learning!! They WOULD have been the amazing party sandwiches that I had so desperately hoped for if I didn’t prepare them so early. I was trying to make sure all of the food would be ready at the same time, therefore I made the sandwiches a couple of hours before everyone came over. So, by the time the guests had arrived, the bread was going a little stale. OK all you experts out there, HELP! Should I put the bread in the refrigerator? Keep it out? How do you keep it fresh? They were still a hit but I have a little more learning to do before attempting to put them out before a group of hungry people again! 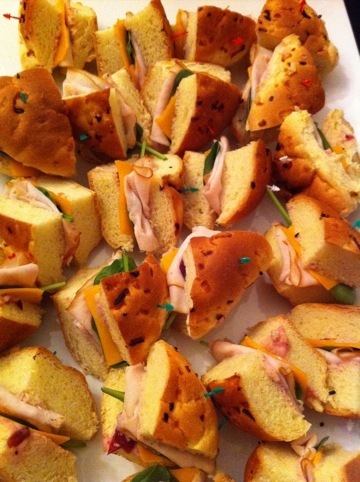 I was pretty excited to make sliders as a part of the spread for Danny and Julio’s birthday party Friday night. I wanted to do something simple since I had not made them before and I didn’t have much time before all of the guests would arrive. Well I made about 14, ate 1 to make sure it tasted ok, then I just waited for people to come! As I waited, I decided I would take two to my downstairs neighbors because I wanted someone to enjoy them while they were hot! 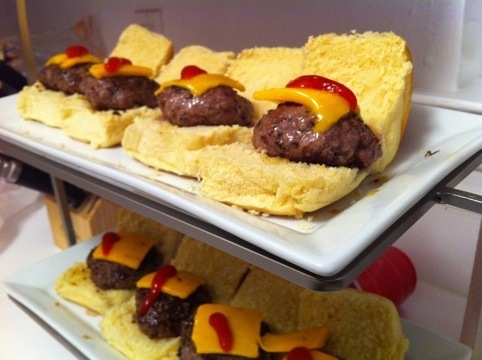 Once the guests arrived, the remaining sliders were gone in about 2 minutes. Uh oh! Realizing the cheese and crackers, pizza rolls and cake were not going to hold everyone over for the rest of the night I offered to order pizza. That wasn’t going to cut it. JMo went out and bought ingredients to make more sliders. I would be lying if I said this was a picture of the sliders I originally made. Instead I will tell you that JMo showed me up in my own kitchen! His sliders were amazing- and Danny had the idea of coating the patties in black pepper corn which made them delicious!